← Keeping it Compact means keeping it People-Friendly! 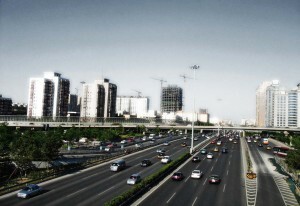 The cities being built now in countries like China or India typically consist of 5-10 storey buildings, normally connected with large but overflowing road networks. With such a setup a lot of land area is lost to roads, and the noise and pollution from the traffic makes it a rather unpleasant habitat. Some places city planners try to improve this by putting parkland as buffers between the houses and the roads, but this causes even more land to be lost and these areas are normally not very successful as parks. The end effect is a rather spread-out city where having access to private transportation is a requirement for a practical life, but where everybody else’s need for the same makes life considerably less pleasant. The most effective way of reducing emissions from traffic and maintaining an area usage that does not require the entire country to be paved over is to build cities that are very compact, thus reducing the need for transportation. This entry was posted in City Planning, Ultra Compact City Concept and tagged City Planning, Dense Cities, Green City, Ultra Compact City, Ultra Compact City Concept, Urban Development, Urban Planning. Bookmark the permalink.